Have you ever read an article abstract and wanted to get your hands on the full article but didn't know where to go to get it? Have you ever gone to order a full-text article reprint from a health or science journal's website only to be staggered by the cost of the reprint? Throughout the United States, Canada and many countries around the world, there are regional (or international) health science libraries that serve as document delivery providers for a wide range of health- and science-related journal articles. These libraries, open to the general public, maintain a growing collection of health-related materials that can be browsed for free in person at the library's physical location. The RHSLs have websites that can also be accessed on a more limited basis by the general public. For a fee, anyone can request that the library order an article for them that the library doesn't already have in its collection, or get a copy of an article in the collection. If you pay an annual membership fee (amount varies from library to library), you will be able to access more information online through the RHSL's website, and get a discounted rate for copies of articles you request from or through the library. To find a list of regional and international health libraries, please go to the National Library of Medicine's Find A Document Delivery Provider page. Sure, you can order a reprint from the publisher's website. But if you are trying to live on your disability benefit payment, you probably don't have a lot of money to spare to buy all the articles you need as you research your illness - not at $20-40 a pop. 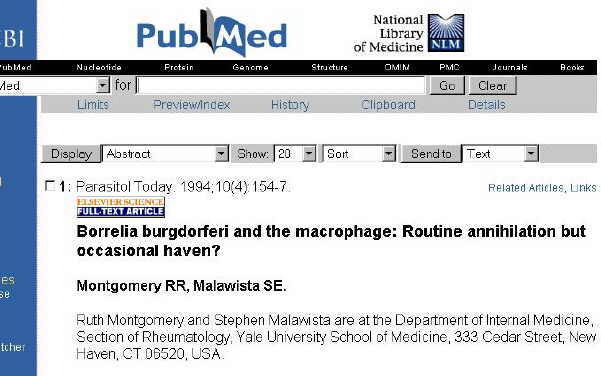 Borrelia burgdorferi and the macrophage: Routine annihilation but occasional haven? My RHSL's annual membership fee is currently $15 (and has been or a while). While the first article I order through my RHSL in any given year will effectively cost me $23 ($15 + $8), I'm still ahead of the game for most journal articles, and subsequent articles that year will be $8 each. If you are in the process of accumulating a lot of articles, this can be a huge savings over time. Plus you help support an important regional health information resource. Fees for membership and article cost may vary from library to library (and country to country), but on the whole, they are a much better source, cost-wise, for those of us on very limited budgets. Many of us search out journal abstracts using the National Institutes of Health's National Library of Medicine's online abstract search engine, Entrez PubMed. 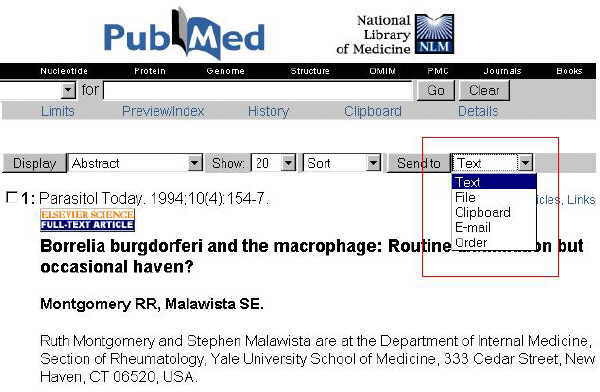 You type in your keywords, hit the GO button, and (hopefully) get a list of journal articles with those keywords appearing in them. When you read an abstract that interests you enough to want to order it, click the drop-down menu next to the Send to option just above the journal name. If you have not previously registered, use the Sign Up link to take you to the registration process, which will include your selecting the regional library closest to you.